One of the awesome new(ish) trends making the rounds is the romantic and rustic floral wedding crown. Offering endless styles and options for flower combinations, it's almost like the new bridal bouquet. For those of you still wondering if we're talking about the hippy floral crowns of old, let me just say, this ain't your momma's daisy chain. Winter contacted me a few weeks back with some pictures and even a hand drawn sketch of what she wanted in her floral crown for her Autumn wedding. She gave me some more details for her big day: out in a field, they would be picking flowers from the property the day of for bouquets, and the ceremony will be outside rain or shine. As you can imagine, pulling together a bouquet of wildflowers for a fresh-from-the-field look is a lot more doable with your bridesmaids than crafting a crown...out of flowers...to attach to your head. I think Winter made the right choice to have this sort of arrangement ready to go before the day of her wedding. She gave me a few more thoughts on what she wanted to incorporate including a larger cream flower, pheasant feathers, and fall colors and foliage. I got to work finding the perfect components and began working on her crown. Since this was a one and done arrangement, I communicated a lot with Winter over email (even though she's local) so we could get the shape, look, angle, and even the side it would go on her head all perfected. I finished the floral crown off with a moss green velvet ribbon. I left the tails plenty long so Winter's hair stylist might be able to actually weave it up into her hair. It's going to be gorgeous! 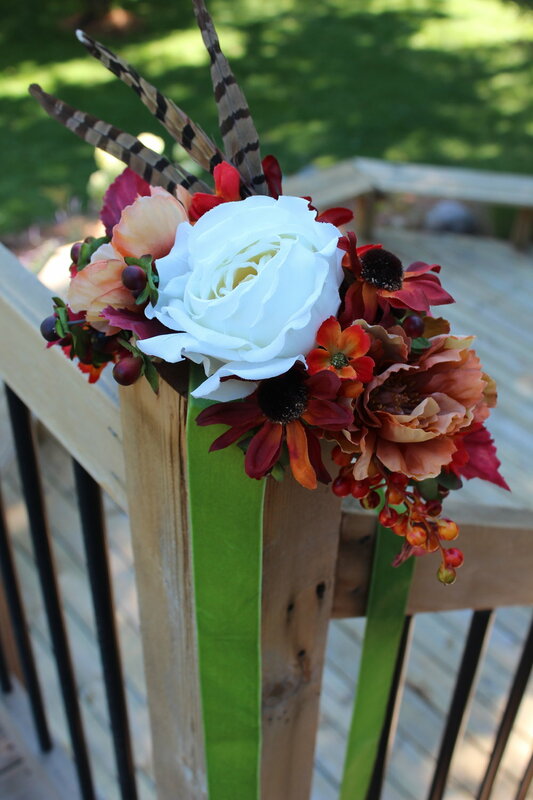 Here are some shots of the floral wedding crown with pheasant feathers. And, because, what's a floral wedding crown without a head under it? Here's me awkwardly posing trying to showcase the beauty of this piece. Thanks again to Winter for bringing this fun and creative piece to me to craft for you! If you're looking for a floral crown, something with pheasant feathers, or another type of headpiece for your wedding day, a custom silk flower crown might be what you're looking for! Send me an email today to see what designs are waiting for you.